Forget mirrors. You can draw in the perfect pair of eyebrows absolutely anywhere if you have a SODIAL Eyebrow Stencil. This crazy shaped device can help you easily pencil in your brows, or so it claims. But is this template as amazing as it seems, or will this product becomes just another beauty gadget that ends up in your junk drawer? 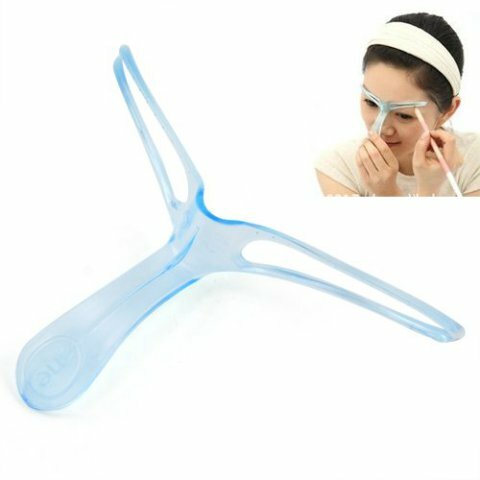 To use this beauty gadget, you just place it over your nose and line the template over your brows. Then with brow powder or a pencil, fill in your brows. The product description on Amazon also recommends using this tool for plucking. Fill in your brows with a dark color, and then pluck the hairs that remain outside of the lines. It sounds simple enough. But according to reviewers, this tool is awkward to hold, it doesn't line up properly and most pencils do not fit within the stencil holes. Even though it's 2 dollars on Amazon, this tool will leave your frustrated. It seems like you'll have a better time spending that two bucks on a cup of coffee and using your morning to practice with your brow pencil, filling in your eyebrows the old fashioned way. This product might be a flop, but there are plenty of amazing beauty innovations out there. Check them out on my blog.